The grounds of the Mercury Equine Center are located on the property that once was the original Spendthrift farm training facility. 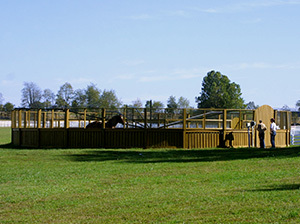 It has been transformed to be a complete equine training center. The gated facility on 60 acres includes a private 5/8 mile dirt training track. The track features the original finish line post from Keeneland race track and includes break-away safety rails. This recognized thoroughbred training center includes a clocker’s stand and gate to turn in official works to qualify horses for gate approval and racing. 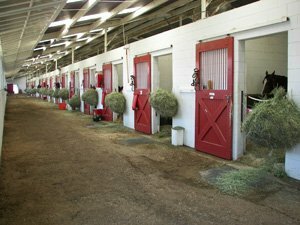 Three large barns contain 160 stalls with extra wide shed rows to train during inclement weather. Veterinarian and blacksmiths are scheduled on a regular basis for examinations and any necessary treatments. A team of veterinarians are on call for emergencies.